Baby would sit and watch us shoot pool for hours. That is one of the most beautiful cats I've seen. I'm not too sure that ended well for the guy behind the door. "Senators more than House members & both more than ordinary people, lie." Holey Moley! How'd they get a horse into that dog costume? 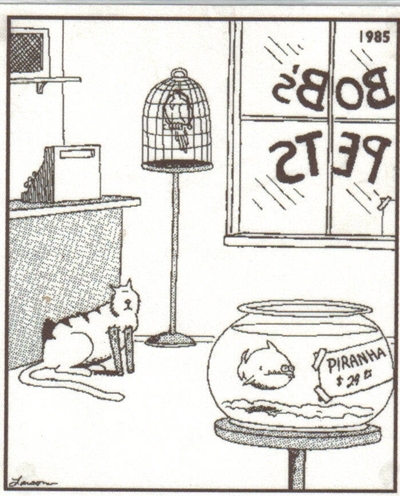 There is just nothing better than The Far Side. You probably wouldn't guess it by looking at him, but Bentley the 8-week-old English Bulldog has a lot of stuff on his mind. Heavy stuff. Stuff he needs to work out without you bothering him. Just look at what happens when his mom tries to get playful with him. Full-on angst, man. Sometimes you just need a night in with your bedroom door closed and a Dashboard Confessional album playing. We feel you, Bentley. Sorry for just adding the link (I'm clueless how to embed the video). While flipping through the channels last night I came across this "pet". I laughed during the entire commercial. Enjoy. That is too funny! The funniest part is the lady on the computer looking at it as if it was real.. that is kind of bizarre! Ya know......it WOULD be interesting for a cat. Every time the cat stops and looks....the bird is stone still. Soon as it walks by, it moves again. According to the commercial, it goes great with other family pets. Page created in 1.295 seconds with 21 queries.